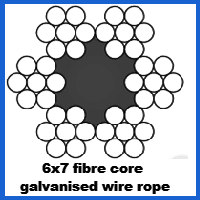 Constructed to deliver a little more flex than some of the other galvanised rope products on our site, this 3mm example with a 6×7 configuration of strands even packs a fibre core for added versatility. You can order lengths of 3mm 6×7 Galvanised Wire Rope cut to size or spec out custom assemblies. We offer this 3mm rope with a trio of different galvanised steel grades, allowing you to pick the setup that makes sense for your needs and your budget. With load limits of up to 597kg, you should be able to shift up to half a tonne of material if you deploy this wire rope in a lifting scenario. You should also have no trouble using this rope outdoors, as the galvanisation process leaves the surface resistant to typical types of corrosion caused by moisture. If you need 6×7 galvanised wire rope complete with fittings and other relevant attachments, Rope Services Direct will be able to fulfil whatever requirements you might have. We have the latest manufacturing equipment and we work with the best materials available to ensure every bespoke project we complete is exactly what our clients asked for. You can get the same benefits with every wire rope variation we offer, including stainless steel and fibre rope. You can email RSD or talk to the team on 01384 78004 if you want assistance when placing an order, are looking for a quote or have a query about our wire rope. 3mm 6x7 Galvanised Wire Rope Overall rating: 5 out of 5 based on 6 reviews.